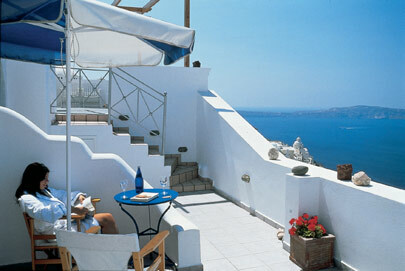 >> Panoramic picture from the balcony of Theoxenia hotel in Fira Santorini. 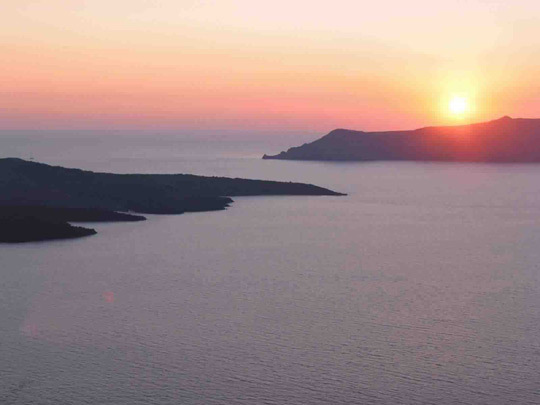 Enjoy the caldera view during the famous Santorini sunset from the jacuzzi. 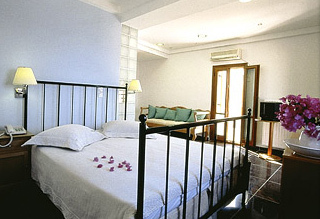 >> Panoramic picture of the suite of Theoxenia hotel. Just outside a big balcony with jacuzi and caldera view. Theoxenia, a member of small hotels of the world, has gained its reputation for the warmest welcome and excellent service as well as the quality of accommodation it offers all these years. 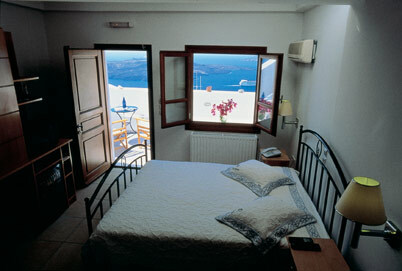 Located centrally, in the famous Caldera cliffside setting, it overlooks the ocean and the Volcano of Santorini. 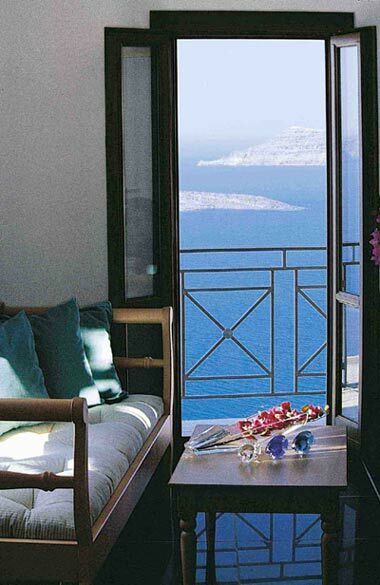 Since its major renovation in 2001, Theoxenia is an ideal place to stay in downtown Fira, with a limited number of 9 rooms, offering a city hotel luxury with a personalized and modern touch. 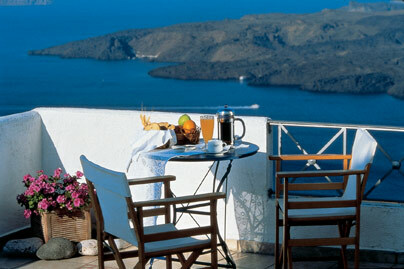 In the sunlighted and relaxed atmosphere of the veranda or the terrace, the Theoxenia Hotel offers an excellent breakfast, with an imaginative touch enriching its original preparation by the owners Christos and Moscha Mendrinos. Furthermore, guests will be asked for an in-room breakfast delivery everyday, fulfilling that wish for "Breakfast in Bed". At check in, an introduction to the island's best destinations is always presented, followed by a map and our experienced recommendations on sightseeing, beaches, restaurants and available tours. Within the rooms, in respect to our Cycladic Tradition, we make your welcome even sweeter by offering you a small taste of our homemade figs and our seasonally produced sweet Vinsanto wine. 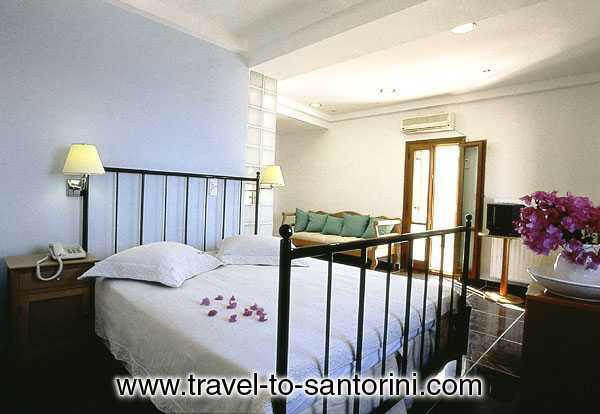 The Superior rooms are priviledged with view to the Caldera and the Volcano, either from your window or the balcony, each furnished with queen metal frame beds and ecological orthopedic mattress with Bamboo foam. All rooms are equipped with a sofa, fully serviced mini bar, direct digital phone line, Satellite TV (CNN included), double glazed windows and noise reduction doors, air-condition or independent heating that can be adjusted at guests temperature desires, hairdryer and Internet socket available to connect your laptop. 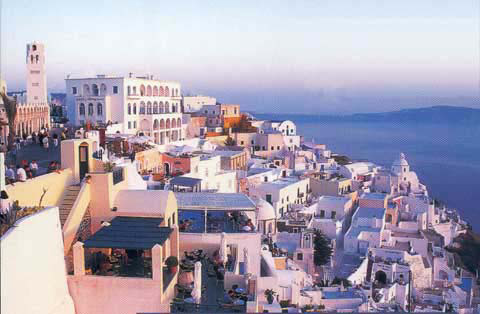 The standard rooms can be more economic, with all the above requirements necessary to make your stay pleasant and relaxed, but their balconies overview the famous Jewellery street and the parade of people walking in the traditional paths of Fira. Every room is an invitation to relax and enjoy oneself. You will be surprized of the Hotel's location. Conveniently next to the best restaurants, taxi and bus service points, museums and traditional footpaths, the Via d' Oro street with its numerous Jewellery and Crystal shops varying from Rolex and Bulgari or Dior to Lalique and Baccarat, the premises are located in less than a minute walking distance. The Hot Tub on the top floor is a getaway from reality. All guests are able to use it from 11am to 11pm. Warm in the summer, hot during the winter, a refreshing bubble bath with view to Volcano whilst an amazing sunset, might just be exactly what you are looking for before an exciting night or a romantic dinner.